Air-conditioning, lights, refrigerators, televisions. Whether it lasts for several hours or several days, a power outage affecting these and hundreds of other devices can inconvenience you and your family and damage your home and possessions. And with many home medical and health machines operating on electricity, that inconvenience can turn into a real health risk. Many Americans are turning to standby home generators to make sure they have the power they need during an outage. If you decide that a standby generator is right for you, the following tips and information should help you get started in choosing and installing one correctly and safely. Standby generators are designed to automatically provide electricity to your home during a power outage. The automatic system constantly monitors utility power 24 hours a day. When power from the utility line fails, the automatic transfer switch (ATS) will safely disconnect the utility feed wires and connect the generator feed. This eliminates the harmful back-feeding of electricity from the house’s generator power to the utility lines. A signal is sent, starting the generator and powering up your home’s circuits. Automatic generators continue to monitor utility power and reverse the “switch” when the power outage ends. They return to standby mode, waiting for the next outage. Standby generators are permanently installed and automatically supply electricity to selected circuits during an outage whether you are home or away. Propane and natural gas offer a safe, long-term fuel supply and are more environmentally friendly than gasoline or diesel fuels. Portable generators supply electricity to selected appliances through extension cords. They are fueled by gasoline, which can be difficult to obtain, store and transport during a blackout. Carbon monoxide is always a concern in the safe use of portable generators as are the weather conditions in which the owner must operate in order to hook up the portable generator to selected appliances. What components and features come with a standby generator? The engine in a standby generator can be cooled by air or liquid. Air-cooled generators are better suited to small homes (less than 2,400 square feet) and serve as backup power for selected circuits in the home. If you have a large home, multiple air conditioning units (either window or central air), or several large appliances or medical equipment that needs constant power, then you might want to consider a liquid-cooled model, which will provide backup power for the whole house and light commercial applications. What should you budget for a standby generator? Where should you buy your generator? You can buy your generator from a DIY retailer, online retailer or from a generator dealer who will offer installation and service. Whichever method you choose, make sure it comes from a reputable store or dealer and with a comprehensive warranty. Standby generators run on either propane or natural gas and can be hooked directly to a homeowner’s existing gas lines, which means that in the event of a severe storm, homeowners have access to a reliable source of fuel to power the generator. In fact, propane marketers are able to provide homeowners with an underground tank that is protected from the elements so that a constant source of fuel is available. On average, a 250 gallon propane tank fueling a seven kilowatt standby generator would provide enough electricity to power a home for five days, while a 500 gallon underground tank would provide 11 days’ power. Should you install a generator yourself? No. It is highly recommended that you have your final generator connections done by licensed professionals. Some customers take the initiative to place and mount the various components, but rely on professionals for electrical and gas connections as well as the proper permitting. Also, it is sometimes necessary to have a generator professionally installed to maintain its warranty. Remember to check with the business that sells you the standby generator about possible municipal permits you may have to obtain to install and operate it. Many stores or businesses will obtain these permits for you as part of their installation contract. Should you notify your utility company that you have a standby generator? Yes. This information is provided to line workers restoring power after an outage so that service won’t be delayed while they check to see that a generator is working properly. Where can I find more information about standby generators? 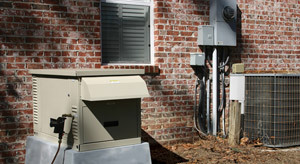 For additional information about standby generators, including a list of manufacturers, please visit www.usepropane.com.